I mostly listen to podcasts in Overcast these days. I banished Apple’s Music app from the iPhone’s dock row to the folder for seldom used Apple apps. If I want to listen to something, I pop open the “Oubliette” folder and jump through menus, or use Spotlight. Siri’s natural language abilities yield mixed results in finding things, though I occasionally give it a shot too. Every now and then — seemingly at random — I get a full screen advertisement imploring me to sign up for Apple Music. I’ve even disabled Apple Music in the Music preferences. For the love of all that is good, leave me alone. I know Apple knows I tried the Apple Music service and canceled it before the free trial was over due to bugs. iCloud Music Library, which was a requirement of Apple Music, caused data loss where it would randomly delete my playlists that predated Apple Music. That was also disabled. I even filed a bug report with Apple, which was closed as a duplicate, so I have no idea if it’s even fixed. That was all supposed to be old news, but then I wanted to listen to a playlist yesterday. All of my playlists were gone, except for one playlist of Star Trek film scores, and the automated “Purchased” playlist. How could this happen? I haven’t had iCloud Music Library enabled, or Apple Music. Fortunately, my Mac’s iTunes Library never had Apple Music or iCloud Music Library enabled, so I can get the playlists back. But … That’s the fifth time I’ve done that (several times for testing back when I did the bug report) so … what keeps my data safe? My Queen Platinum Collection set is showing the album art for “A Night at the Opera” on my iPhone, but the correct gray and black art in iTunes where it originated. Why? Naturally, I assumed that I must be back in iCloud Music Library, so I went to disable that. To my chagrin, there is neither the option to enable, nor disable, it my preferences on my iPhone or in iTunes. Schrödinger’s Music Library Setting. I started spelunking around Apple’s support pages and the “Apple Support Communities”. These forums are full of people struggling with iCloud Music Library and Apple Music issues. Missing custom radio stations. Even playlists. There’s also some advice I’m skeptical of, like deleting your web history in Safari to restore your playlists. A cursory glance through the forums seems to indicate that either the 9.2 or 9.2.1 update is when most of the people in the forums think they lost their playlists. Some had Apple Music enabled, some did not (like me). Extricating myself from the human suffering and bad advice, I decided to just try to sync with my local iTunes Library again and cross my fingers. The sync didn’t copy over any music, album art, or playlists, in spite of the boxes all being checked in iTunes. I’m going to need an old priest and a young priest. Going down this rabbit hole of fuckery just made me realize how much I absolutely loathe the Music app. What was once a major strength of Apple — a simple-to-use music player and digital storefront — turned into the kind of garbage software that runs on cable company set-top-boxes. The experience has been turned into something more akin to a website for a print publication. 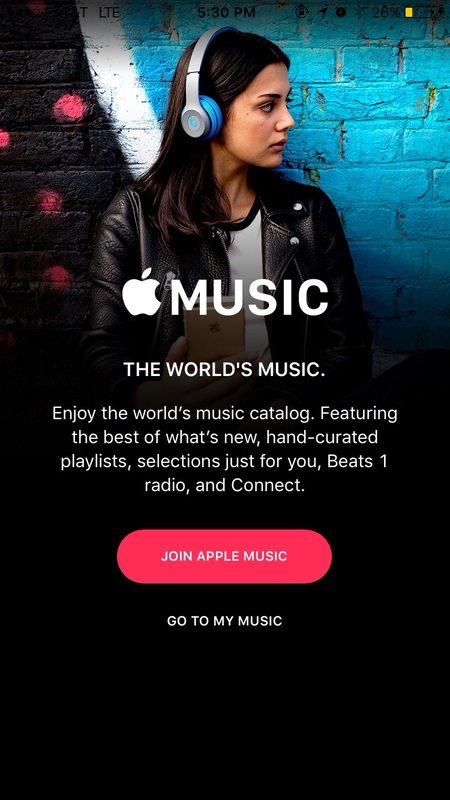 You’re constantly jumping in and out of various things, which slide in from different directions, the stuff you want is buried several taps deep in hierarchical menus, and it’s centered around getting you to sign up for Apple Music. Full page ads are for morally-bankrupt growth-hackers. UI chrome that functions if you pay for something is a gnawing reminder of this. Even with the option to show “Apple Music” disabled, you still have have to deal with a hierarchy of icons that devotes half the persistent navbar to “Radio” and “Connect”. Radio is useless without a subscription now, and Connect is useless even if you had an Apple Music subscription. Infuriatingly, Apple Music even contaminates simple things like sharing. Nearly every aspect of the interface as a share button buried somewhere in it. That’s wholly dedicated to generating links to music in Apple Music. If you try to share something purchased on iTunes, but not in Apple Music, it doesn’t generate an iTunes link, it generates nothing. It succeeds at generating nothing, which is the really wild part, since obviously, I wanted to send a completely empty tweet. That’s been like that since the beta. Brilliant work. Kudos. I don’t typically say anything nice about Amazon. They don’t exactly inspire passion. They are the cardboard they ship things in. When I wanted to listen to my copy of the Tron Legacy track, I realized that it wasn’t in iTunes, because the smart playlist that’s supposed to sync it over was missing, and I purchased it on Amazon. If I wanted to listen to it when I was at work, I was going to have to download the Amazon Music app for iOS. I’m quite glad that I did because it has really changed my opinion of Amazon, and Apple. You sign in, and you have everything you’ve ever purchased through Amazon, or if you have an Amazon Prime subscription, you have access to their streaming Prime Music service. I mooch off of my boyfriend’s Prime membership, so my Amazon account does not qualify for Prime Music. Still, I made many Amazon Music purchases in my rebellious years, and I have access to all of them. The application is dead simple. Black, with elements of transparency like smoked glass. There’s a simple, sliding interface where you move your thumb left to right to shift from album, to artist, genre, etc. Then vertical scrolling. A bar with controls is a persistent element at the bottom of the screen, with better tap targets than iOS. Everything loads fast, and smooth. I experienced no hiccups on cellular or WiFi. There’s offline playback as well, but the default is to stream everything. Playlists created on my iPhone are also instantly available on the web client. There’s seemingly no lag at all. Maybe they self destruct like Apple’s playlists, but there’s only one way to find out. 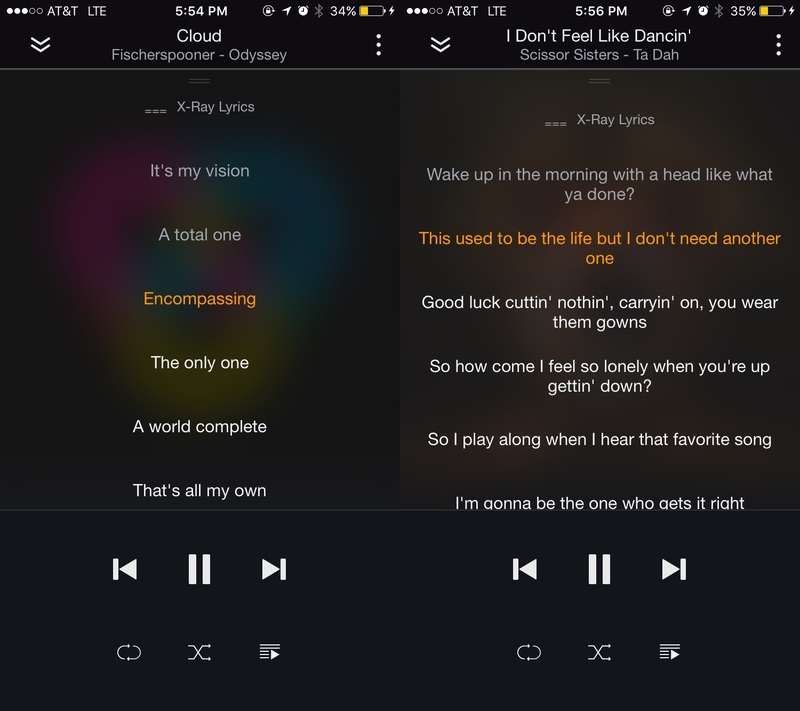 A fascinating addition is the X-Ray Lyrics feature available for some tracks. Not every song on an album is guaranteed to have it, but those that do have a small badge to the right of the track name. While playing the song, you can see a banner on the bottom that displays the lyric that’s being said while it’s being said in the song. If you expand the lyric view, you can see all the lines before and after the current line with the current one highlighted. It’s like a tiny karaoke-machine in my pocket. Apple thinks I want to look at magazine-spreads of band members, and Amazon thinks I want to know about the music. I’ll let you guess who nailed it. There’s no option to share music, or generate links to buy music on Amazon’s store, but Apple executes that so poorly that it’s not something I miss. Another major downside is that it doesn’t integrate with things like Siri, and there are no Amazon apps for the Apple TV. The app does include an AirPlay button (if there’s an AirPlayable device near) in addition to the one in iOS’ Control Center. If you want to purchase music, you have to do it through a web browser, not through any Amazon app. That could be a huge setback for some people, but with the way the iTunes Store App is it’s like six of one and half dozen of the other. 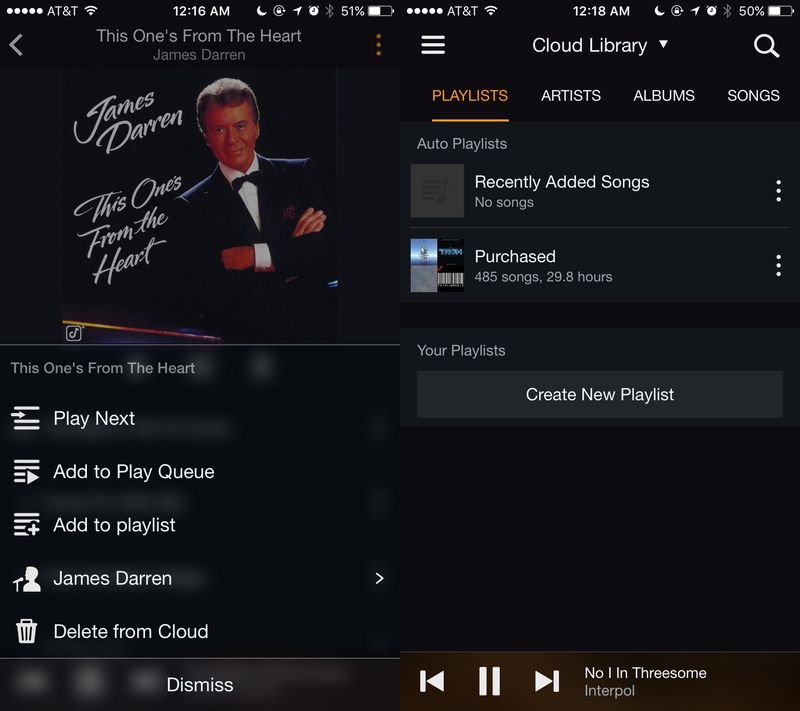 If you do certain things in the interface you run into paywalls for Prime Music, where it nudges you that a certain feature — like uploading music not purchased on Amazon — is only available to Prime customers. I didn’t find it egregious compared to Apple’s nonsense. Even comparing the cost makes it seem more than equitable. Amazon is routinely criticized for their grotesque, and difficult-to-use software, but comparing Apple’s and Amazon’s music apps is like night and day. How did Amazon manage to out-Apple Apple on Apple’s own platform? The application is not only slick, but it’s considerate.